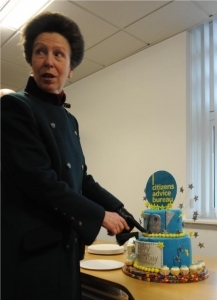 On Friday 10 December 2010, HRH The Princess Royal, National Patron of the Citizens Advice Bureau service, formally opened Bournemouth CAB’s fantastic new offices at the Kinson Hub. Her Royal Highness showed her renowned “hands-on” approach by spending a lot of time with the Bureau’s volunteer staff and clients, discussing the practicalities of advice work, as well as learning more about the innovative new ways the Bureau is utilising to operate in the modern age. The CAB’s Kinson Hub office is set up to deal with telephone and email enquiries, and also offers face-to-face advice by prior appointment with the Bureau. CAB volunteer Betty’s 90th Birthday. It was with particular pleasure that we celebrated Betty’s 90th birthday in April 2011 with a surprise party; Betty has been volunteering with the Bureau since she was a mere stripling of a gel in her late 70’s, after a career in Social Work. Born in 1921 in the East End of London to immigrant parents from Eastern Europe, Betty’s current role is to “meet and greet” new clients, and offer assistance and a helping hand to them in the Bureau’s waiting area, prior to the advice interview. 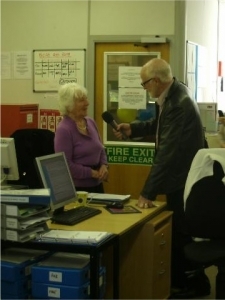 Betty’s calmness under pressure was admirably demonstrated with her ability to instantly recover from walking into the surprise party, when she was immediately asked to do an interview for BBC Radio Solent. What a Trouper!